Building Up to Epic - Writer-director Dean DeBlois steers into trilogy territory on a large scale with How to Train Your Dragon 2. Passion Play - Documentary Between Frames uncovers hidden gems in Brazil's animation history. Bending Time and Space - Veteran Family Guy Producer Kara Vallow and Six Point Harness talk about developing a style worthy of the grand scale of Cosmos: A Spacetime Oddyssey. 42 MPC Adds Menace to X-Men's Sentinels - The secrets of animating the mutant-menacing future Sentinels. 42 Obeying Gravity - Animators learn the physics of being a superhero for The Amazing Spider-Man 2. 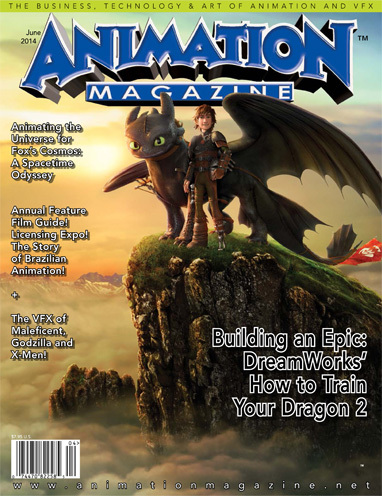 How to Train Your Dragon 2, Cosmos: A Spacetime Oddyssey, Between Frames, X-Men: Days of Future Past, The Amazing Spider-Man 2, Godzilla, Maleficent, the Animated Movie Dossier and much more!